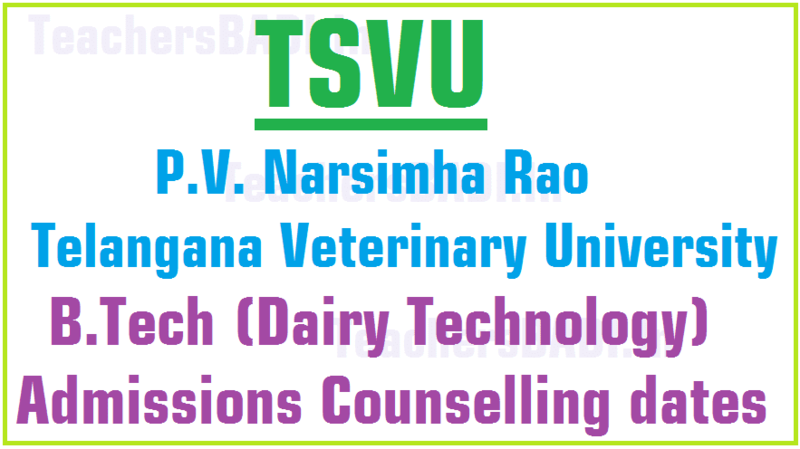 #PVNR Telangana Veterinary University - B.Tech (Dairy Technology) Course, TSVU B.Tech (Dairy Technology) Admissions Counselling 2017: P V Narsimha Rao Telangana Veterinary University has announced the B Tech (Dairy Technology) Admissions Counselling 2017 notification under Farmers’ Quota. The Counselling for B Tech (Dairy Technology) admissions for the year 2017-18 under Farmers’ Quota will commence from 9.00 AM on 12-7-2017 at Address Hall, Administrative office, PVNR Telangana Veterinary University, Rajendranagar, Hyderabad-500030. Admissions for 21 seats under Non Farmers’ quota were already undertaken by JNTU through the regular Engineering counselling. "Counselling for B Tech (Dairy Technology) admissions for the year 2017-18 UNDER FARMERS’ QUOTA will commence from 9.00 AM on 12-07-2017 at Address Hall, Administrative office, PVNR Telangana Veterinary University, Rajendranagar, Hyderabad-500030.Admissions for 21 seats under Non Farmers’ quota were already undertaken by JNTU through the regular Engineering counselling." 1. Candidates should belong to Telangana state. However one seat is under unreserved (UR) category. 2. Pass in Intermediate course under MPC stream. 3. Rank in Telangana state EAMCET-2017. 5. The student or his parents should possess at least 3 acres of agricultural land. The land cannot be in the name of grandparents for eligibility. Certificate to that effect must be produced (Produce Form I or original pattadar pass book). Registration will commence at 9.00 AM on 12-07-2017. Applicants must register by paying fee of Rs.100/. Selection will be based on TSEAMCET, 2017 rank and category wise availability of seats. Selected candidates must pay fee of Rs.7500//- immediately and confirm their seats failing which next rank student will be called for the counselling. This is in addition to the college and hostel fee which is to be paid on the date of joining the college at Kamareddy on 17-7-2017. Format of Form I and Form II are given below link. They should be filled up and got signed by the appropriate/designated authorities for submission at the time of counselling.